Russell Palmieri specializes in the creation of one-of-a-kind “forever homes.” This ultra-luxurious property is no exception. Priced at $5.2 million the home is nestled on 110 feet of waterfront with striking water views throughout, a private dock and direct Intracoastal access. Bringing the outdoors in is also a theme of the spacious design. There is a summer kitchen with grille, swimming pool with two sun shelfs. 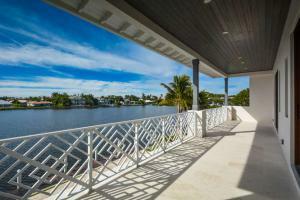 MANALAPAN, FLORIDA, UNITED STATES, January 11, 2019 /EINPresswire.com/ -- With an eye for ultimate waterfront living, luxury home builder Russell Palmieri has captured the charm and casual elegance that is classic South Florida in a new 6,500 square foot home in Manalapan, Fla.
“Manalapan is a wonderful ocean town - beautiful, safe, in the vicinity of shopping and culture. It is a great place, whether you would like to raise your children, spend vacation time or retire. Manalapan has it all,” noted Helen Salus Braun, who commissioned Palmieri to build the home. 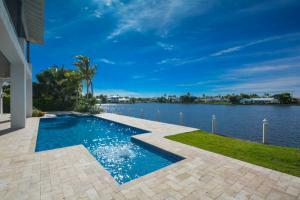 Located off the Sunshine State’s East coast on a tiny sliver of land south of West Palm Beach, Manalapan’s status as one of the most affluent towns in America is well documented. So is Palmieri’s PalmCorp Construction Services reputation for building quality with a unique architectural style and the latest energy efficient features. All encompassed in this beautifully designed, open and airy two-story residence with a great layout with high ceilings, giving the house lot of light and harmony, balcony and three car-garage. Priced at $5.2 million the home at 70 Spoonbill Road is nestled on 110 feet of waterfront with striking water views throughout, a private dock and direct Intracoastal access. A boater’s paradise with amazingly scenic waterways, South Florida is well known for its cyan waters and white sugar sand beaches. Elegant with an effortless feel, the generously scaled five-bedroom, five-bath concrete dwelling has master suites on each floor together with upstairs and downstairs with large closets and refreshment lounges, elevator and marble flooring throughout. A fireplace, impact windows, Waterworks plumbing fixtures and Thermador gas appliances accent its tropical-motif. Imagine escaping to a tranquil, relaxing space in the massage room. The Butler’s pantry, perfect for people that entertain frequently, has a built-in coffee/cappuccino maker. Then there is a walk-in pantry, extra space added onto the kitchen for storage. Bringing the outdoors in is also a theme of the spacious design. There is a summer kitchen with grille, swimming pool with two sun shelfs. The great outdoor entertainment and recreation area is seamlessly connecting the open kitchen and large living room. Other features include upstairs/downstairs laundry room and temp-controlled wine room, security system, Cat VI wiring, sprinkler system and whole house generator. With an emphasis on form and function, Palmieri specializes in the creation of one-of-a-kind “forever homes.” This ultra-luxurious property is no exception. “Building a house is a process that requires a builder with skills documented by their track record. It also demands integrity, imagination and flexibility. All those we found in Russell. He not only met our expectations, he and his team exceeded them,” added Braun. Russell Palmieri has been developing exclusive residential neighborhoods and building custom single-family homes all over Palm Beach County since 1966. For more information contact PalmCorp Construction Services, Inc. at (561) 429-4268 or info@palmieribuilder.com. Visit http://palmcorpconstruction.com.